The crew at USCG Station Cape Disappoint work in a place where heavy seas and surf aren’t just possible, they are damned likely. The station’s back yard is the Columbia Bar – one of the most dangerous stretches of water in the world. What does the station like to do when the roughest of the water rolls in? Go out and play in it of course. 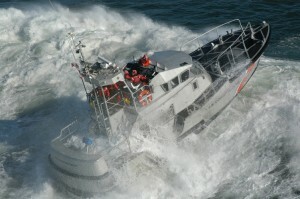 The surf creates an opportunity to practice their world-class driving skills in their 47 foot Motor lifeboats, self-righting rescue machines that can survive being capsized and return to upright in under 30 seconds. Here, see for yourself. The gang at Cape D. recently uploaded a video of one of their surf training sessions, complete with a full knockdown at minute 2:40 and a very close call at minute 4:17. The video is worth the five minutes if you want to know what the U.S. Coast Guard small boat community goes through to keep you safe. Semper Paratus, and stay safe out there.